Today is Monday, day two of our Freedom of the Seas cruise. Today is a sea day, no ports. 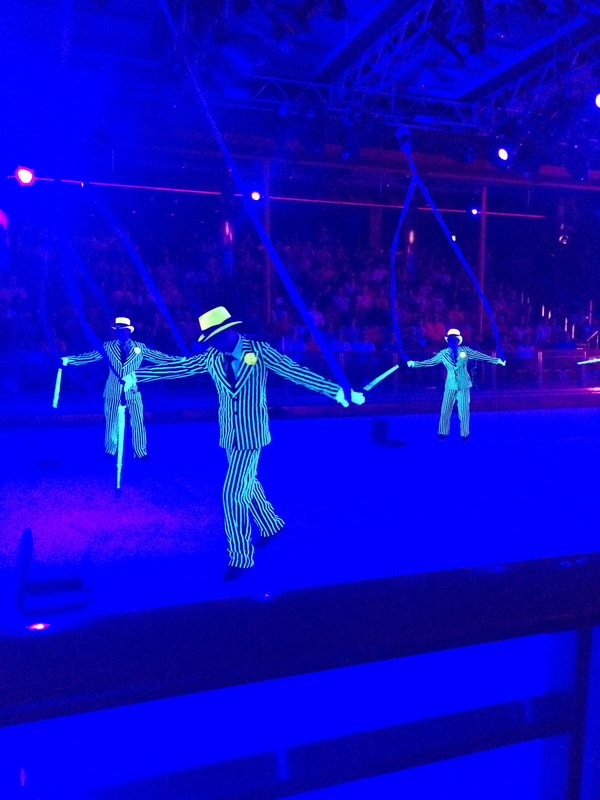 We have some pretty cool things on tap today including an ice show…at sea!!! This was also the day where we met many more of those “over and above” staff members. Ones that we would return to over and over again throughout the cruise. Sea days are the best days to ensure you are getting your money’s worth out of your drink packages! Which would explain why all the people that we met and loved today are bartenders! 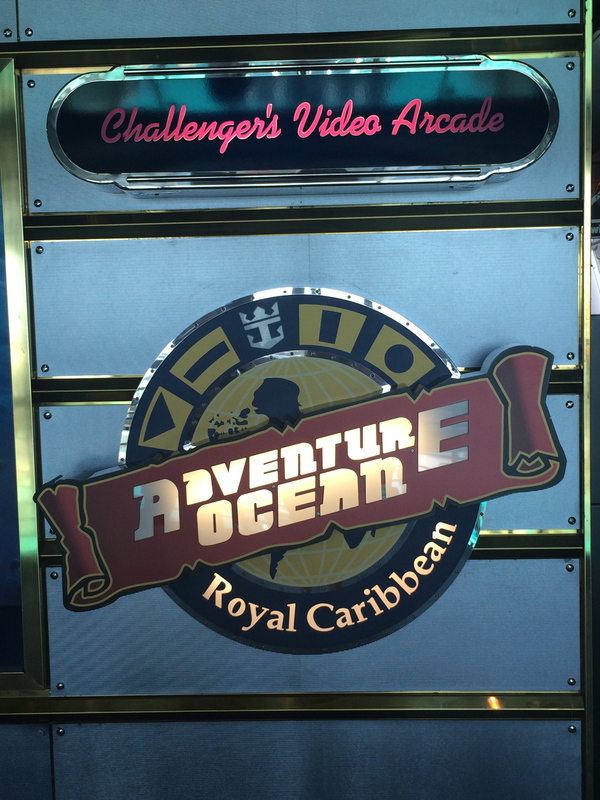 The eleven year old “TJ” spent almost every waking moment at Adventure Ocean. He made a bunch of friends and they were either here or in the pool almost the entire cruise. The toddler “KT” is just a bit too young to go just yet so she spent almost all of her time in the splash zone, which is how we came to spend a great deal of time at the Juice Bar, which is right there next to the splash zone. Don’t let the name fool you, while they do have juice and other assorted healthy options for those so inclined, it is a full service bar with two of the best bartenders on the ship. Sanjay from India and Sirjohn from Bosnia Herzegovina. Our relationship with these two started with a mistake. One of us “P” ordered a pineapple “Margarita” and received a pineapple “Mohito.” The down side to the location of the juice bar is the same as the upside…it is right next to the kids splash zone…so it is loud. So Sirjohn made the wrong drink. However, it was FANTASTIC!!! 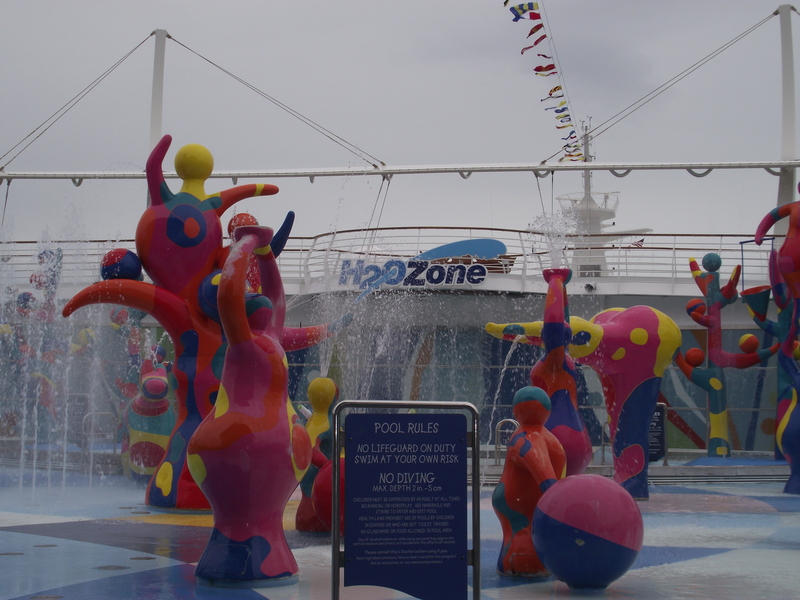 It was so good, we all walked back over and just pointed at the “mistake” and said “Make me one!” For the entire rest of the cruise, if KT was in the pool, we were at the Juice Bar. All we would ever do was ask for something “pinappely” or “coconutty” and one of the two of them would come up with something fantastic! I had made reservations for Freedom on Ice. This is an ice show, on a moving ship, in the middle of the ocean, on ice skates, on ice. Let me tell you these performers are amazing. They don’t phone it in at all they axel, and lutz, and salchow, and flip, and throw all while the ship rolls and bobs its way through the Caribbean. And while I will tell you that we were blessed with calm seas and smooth sailing for the entire trip, these folks really put on an impressive show. KT and I got there early, and as soon as the person checking our reservations saw my red-headed, curly haired girl, they put us in the front row and told us to be prepared to have her be part of the show. And the show was COOL!! KT loved every minute of it and looked as if her head was on a swivel she was so enthralled! And at toward the end of the show, one of the performers came over to the rail and lifted her into a sleigh type thing and skated her around the rink to her absolute, utter delight! When the show was over, I went to find P, who had missed the show. I found him in the casino, where he had entered the slot tournament qualifier…and qualified! Well, that sounded fun, so I decided I would enter the next one later in the week. Tonight was formal night, so we all went to our respective cabins to rest/shower/etc. in preparation for formal wear and our first dinner in the Main Dining Room. We decided to meet for a pre-dinner cocktail in the Champagne Bar, where we would meet yet another favorite bartender! 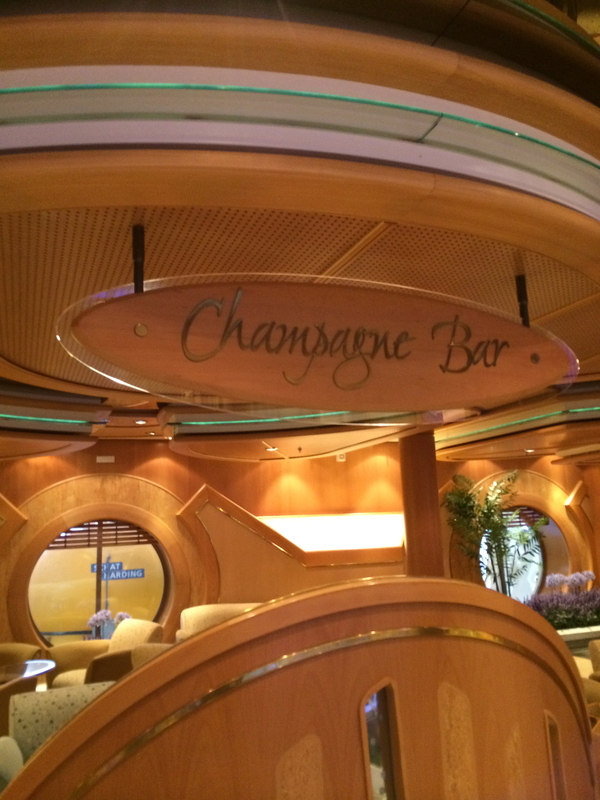 The Champagne Bar became our nightly pre-dinner ritual for many reasons. It is right in front of the dining room, so if we were a bit early, we had someplace to get a drink, the chairs and sofas are comfortable and well laid out for conversation, and last but not least…Erwina!! The Champagne Bar has a limited bar menu. They have champagne, of course, and wine and most mixed drinks. They do not have an extensive beer list, so if that’s your poison, you might want to head a few doors down to the Bull and Bear Pub. But what this place does have is a massive martini list. We decided to try our luck and just tell Edwina what kind of flavors we liked and see what she could come up with. We were never disappointed and in fact found a few that we LOVED (looking at you Starbucks espresso martini!!). As my first beverage, Erwina made me a Pear Melon Martini. It was wonderful! Light, refreshing, not too sweet, a perfect pre-dinner cocktail and I walked in to the dining room ready for a fantastic formal night dinner in the Main Dining Room. Unfortunately it all came to a screeching halt at that point and this dinner became our second disappointing dinner in as many nights. What was going on?? Our previous Freedom cruise, the staff in the main dining room was one of the highlights of our cruise and something my children still speak of fondly. These are kids that can’t remember to put the milk back in the fridge, but they remember the names of the waitstaff we had four years ago! Could the service have fallen that far? Or was this just an off night for the servers? Hopefully the latter, but two lackluster dinners in a row had us skeptical. GM, M, and OD wanted to go to the production show at 9pm. When we were on the Freedom four years ago, the same show was playing then, so I didn’t feel the need to see it again and P really had no interest, so while they SPRINTED from the dining room to the theater, we took TJ and KT to Ben & Jerry’s for some ice cream, got them settled in front of a movie for the evening, and headed down to make our nightly donations to the Casino. After the show was over, GM headed to bed, OD headed to the teen club and M found us in the casino where he described the show as “A very good show choir” performance. M is a musical theater major and sometime professional actor so he is VERY picky about his theater. The theater on the Freedom is plenty big enough to not worry too much about finding a seat and you do not need to pre-reserve anything except the ice show. 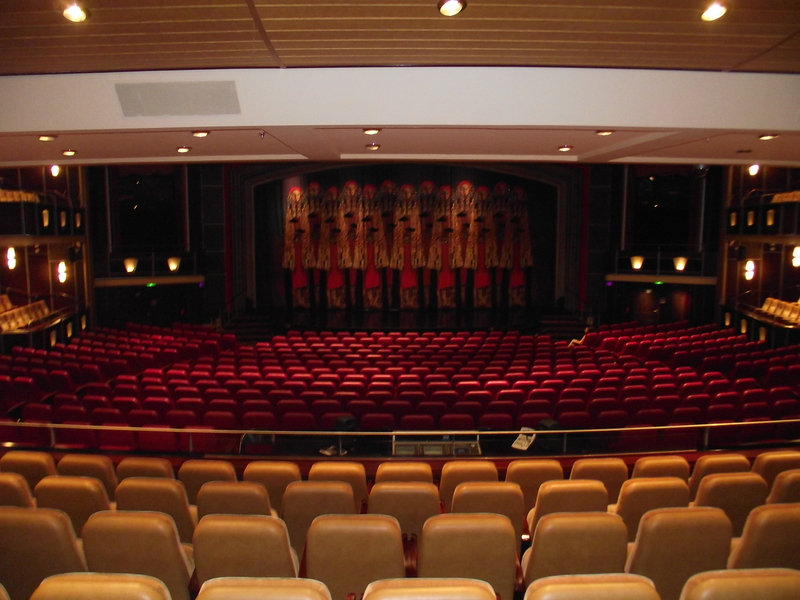 There are two levels to the theater, so you can see…plenty of seating! We ended the night in the casino as usual! However, we realized that P’s card was not tracking his points! He had already spent quite a bit of time playing so this was a huge problem. We talked to Bryan about it and he said he would take care of it…more on that later!